Catholic, Gothic, Gothic Revival, William Hall, John Hardman, Hardman Studio, high alter, Hobart, Henry Hunter, lancet window, St Mary’s Cathedral, Byron Malloy, tabernacle, Tas, Tasmania, tower, tracery, William Wardell, Robert William Willson, Bishop Willson. The building of St Mary’s Catholic Cathedral, Hobart, Tasmania, was instigated by Tasmania’s first Catholic bishop, Robert William Willson (1794-1866). The building was designed by William Wardell and built between 1860 and 1866, supervised by Henry Hunter (1832-1892). It was opened by Willson's successor Bishop Daniel Murphy (1815-1907). However the building was found to be faulty and had to be largely dismantled and rebuilt to a modified design by Hunter between 1876 and 1881. The building is in the Gothic Revival style. The interior includes pointed arch windows and columns supporting pointed arch openings within the nave. A survival from the original cathedral is the Hardman window. The stained glass window was made by the Hardman Studio run by John Hardman in Birmingham, England. It is based on Gothic windows of the fourteenth century and features five lancet windows and tracery. It is a memorial to Bishop William and his Vicar-General William Hall (1807-1866). Below the window is the tabernacle. It is made from the remains of the high alter carved by Byron Malloy that was installed at the re-opening of the cathedral in 1881. 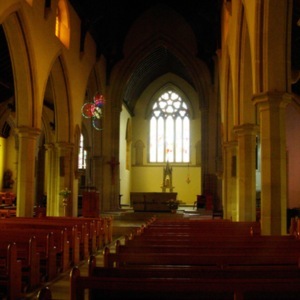 “St Mary’s Cathedral interior, Hobart, Tasmania,” Medievalism in Australian Cultural Memory, accessed April 23, 2019, http://ausmed.arts.uwa.edu.au/items/show/1140.